Boutique Sol offers 5-star ambience "Other than the regular facilities, The Sol swanks with a tropical courtyard pool, a well stocked bar, a fine dining area serving not only international cuisines but also granny's local favourites as well as a spa with paddy filled views for a calming and rejuvenating experience. 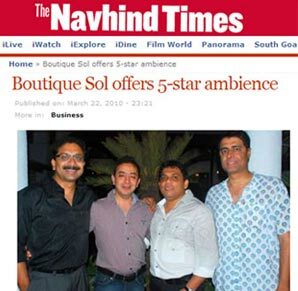 Mr Suraj Morajkar of Sun Leisure's said, it is built to exude luxury and warmth. "The Sol has the calm Sinquerim River flowing on one side and lush paddy fields bordered by fresh green hillocks on the other."